Energy has been a top performer for decades. Over the past few years it has seen a volatile road crashing from highs. Recently oil and gas rallied into late autumn, however, there has been a recent correction. This correction is another, maybe the last, excellent opportunity to buy into the “Last Great Secular Oil Bull Market” in my opinion. There is a current narrative by oil traders on the short side that America’s oil companies that use hydraulic fracturing – frackers – will suppress oil prices by recreating an oil glut. Goldman Sachs (GS) suggests that fracking will keep the the price of oil at or under $60 per barrel. My opinion is that the traders are merely talking their books and that Goldman Sachs, in its all too regular manner, has deeper and self-interested motives steering its commentary. Remember, this is a company that was on both sides of the real estate derivatives trades before the financial crisis. Goldman’s analysis of anything that involves so much money, is in my opinion, worth taking with a grain of salt, and often, in my experience, used as a contrary indicator. Can you imagine why Goldman is talking down oil now? I can. They could be short now and want to be long later. While there is fracking going on in multiple oil fields, the overwhelming majority of onshore production increase is coming from the Permian Basin. The rest of the U.S. oil production increases are coming from the Gulf of Mexico. What should jump out is that there is virtually no new oil production in the U.S. ex-Permian and ex-GoM. As I have discussed in other articles, virtually every other oil field in America is hitting natural and economic barriers to growing production. Only with more expensive oil does it become economic to increase development in most other areas, if there is even more oil left to be had. Depletion in many counties is a real issue. So, while U.S. production rose overall, it is becoming more concentrated. More concentrated means that the oil supply is also more controllable by the significant operators. I would posit that the frackers can do math. It is in the frackers interest to not pump capital in higher production that meaningfully causes a decrease in oil prices. Not only do they make more money from higher oil prices, but they save inventory and money by properly managing their production calendars. I am not sure that the EIA is on the money here. While an increase in production seems inevitable, an increase to 11mbd by the end of 2018, which is what it would take to average 10.6 million for the year, seems far fetched to me. 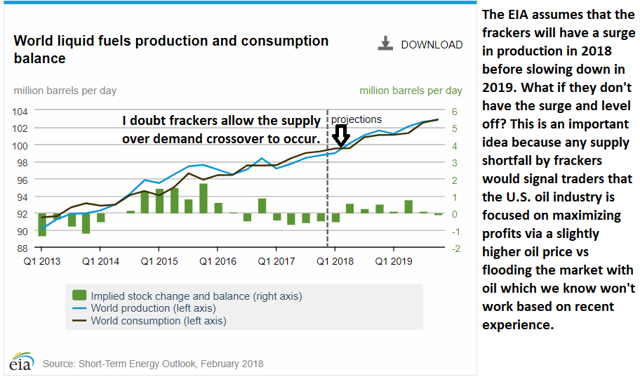 With current production at 10.2 mbd, that would mean expected production would have to surge by 800,000 barrels per day, essentially all from the Permian and Gulf of Mexico. What if the EIA’s more conservative projections for 2019, kick in sooner? What if frackers can indeed do math. If they keep their production at 10.6-10.8 million barrels per day later this year vs 11 mbd, that keeps oil markets in a supply deficit by a hair, which is a bullish proposition for oil. 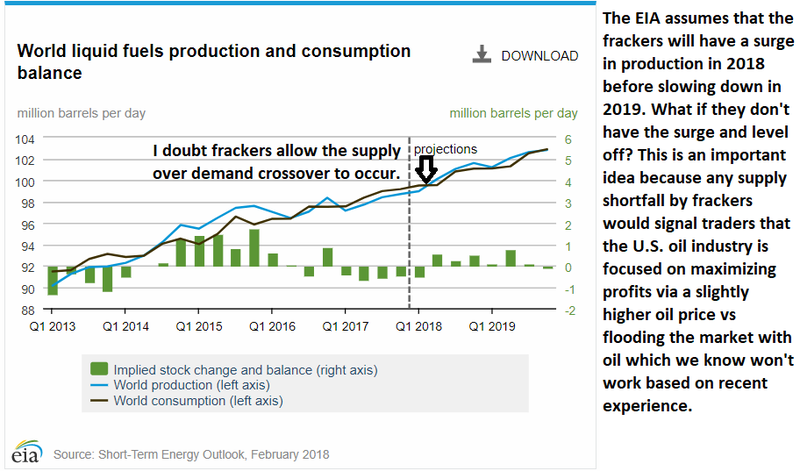 Consider that the current “higher oil production and lower oil price” narrative can be easily disrupted if frackers and Gulf of Mexico just show some small semblance of self-control. It will only take a handful of big producers to suppress supply below EIA estimates. Should they choose to do that, then traders will be forced to cover their short positions, pushing oil prices significantly higher. Take a look at the high level of oil shorts from commercial hedgers. I’m not so sure the commercial hedgers are the smart money this time. 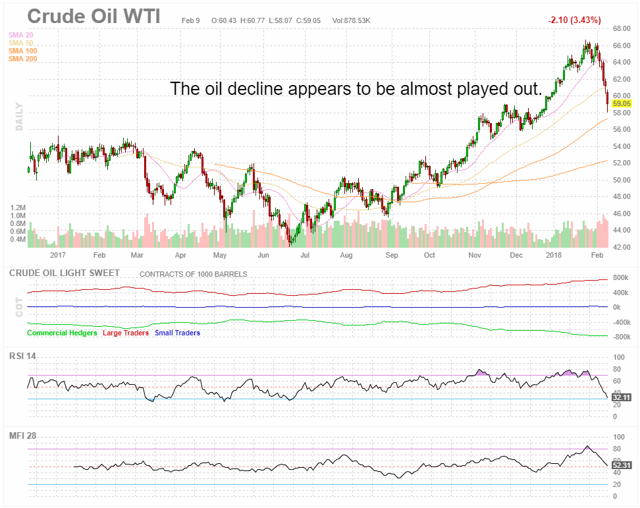 They do clearly have a hold on oil prices at the moment, however, that can reverse quickly. The big difference between large traders and commercial hedgers, clearly spurred a technical correction in oil that was egged on by the EIA’s very bullish forecast on increasing U.S. oil supplies in 2018. Let’s think about a few things though. Who are the commercial hedgers? By and large, many of the companies are fragile financially or at least in need of certainty in oil pricing. It is not likely those companies were making directional bets on the price of oil. Thus, the correlation that some analysts have pointed out regarding those hedging activities is not high and may only be anecdotal. In other words, other than for short-term (months) trading purposes, the wide variance between the long positions of large traders and short positions from commercial hedgers isn’t on its own predictive of intermediate term (years) oil price movements. The oil price has in fact declined quickly in recent weeks. That is the market doing what it does and trading with the day’s narrative. 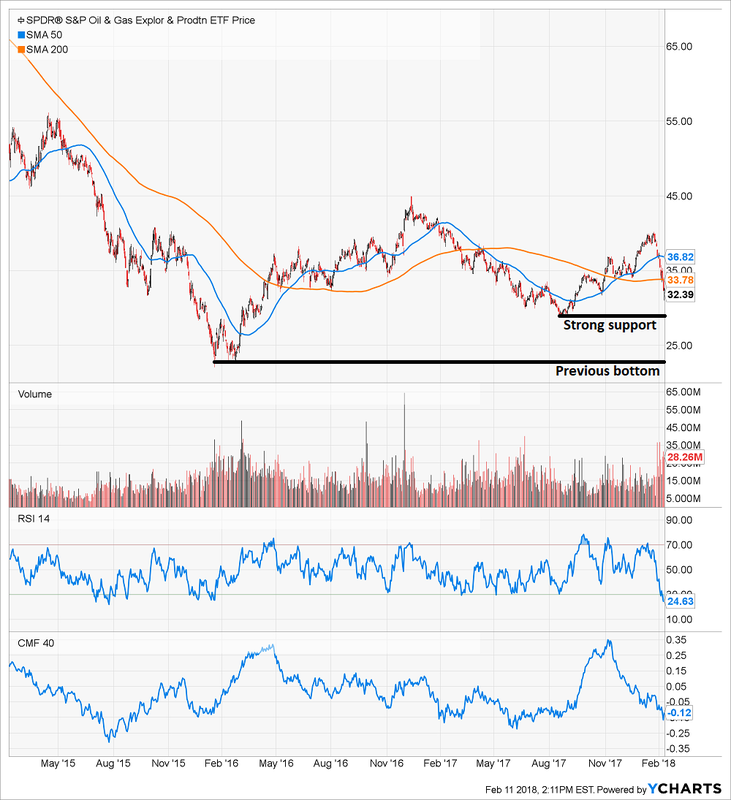 Dale Pinkert, a commodities and currencies trader with 30 years experience, who is with Forex Analytix, told me last week they were targeting the $58 level for WTI crude. We’re just about there already. From that level, or thereabouts, the difference between the long and short positions of the large traders and commercial hedgers would be expected to narrow again as some shorts take profits and some longs cut losses. As that happens, the short-term pressure on oil prices will dissipate unless there is some fundamental reason why oil prices should remain under pressure. I believe that the intermediate term picture for oil is very bullish as I outlined in the “Last Great Secular Oil Bull Market” article linked above. So, as some shorts cover and longs capitulate, that would imply a return of the uptrend in oil price unless the EIA is somehow right and Permian and Gulf of Mexico production continue to surge. There are very real natural and economic barriers to the EIA being right as I discussed above. On March 26, after some delays, China plans to launch its crude oil futures contract. This is a big deal as the U.S. dollar has been the only major currency to be used for trading oil since the early 1970s after a deal cut with Saudi Arabia. If you don’t understand the petrodollar, here’s a brief synopsis. I will go more in depth later. America’s “petrodollar” effectively required nations to need dollars to acquire oil. So, before purchasing oil, nations or companies would have to acquire dollars to buy oil with. This effectively acted as a tax on the rest of the world. How this worked is fairly simple, other nations would buy dollars, supporting the value of the dollar, which in turn allowed the U.S. to borrow extensively without hurting the value of the dollar or causing inflation. For Americans this means that the dollar, short of a crisis with a flight to safety supporting it, is about to come under continued pressure. To be sure, some of the pressure the dollar has experienced lately has been a response to the Chinese pressure. In my forecast article, I stated that macro analysis would come back to the forefront after several years of being in the pits. That is happening now and the dollar is under pressure. The risk premium, of course did start to happen immediately following the Syria attack. I then wrote here on Seeking Alpha about a returning risk premium and potential conflict within and/or with Iran that could cause supply disruptions. Again, the price of oil rose for months after the “Missing Risk Premium” article. Despite huge criticism of my Iran thesis, in late 2017 and early 2018 there were significant protests that became bloody in Iran. While no disruptions occured due to the conflict in Iran, I believe it is a harbinger of a bigger conflict to come. While Citi might be talking their book, they can’t create the circumstances that would lead to a win for them. They are merely taking a directional position and stating why. As I edit this I will insert here that yesterday, Israel got into a scuffle in Syria. The Israeli air force struck a dozen military sites in Syria, including four Iranian outposts after a Israel intercepted an Iranian drone that had entered Israel’s air space. If am right and the price of oil is headed to $80 per barrel between summer of 2018 and summer of 2019, then overweighting the sector makes a lot of sense. 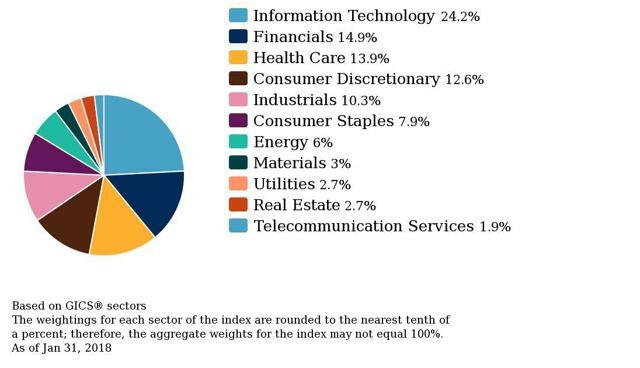 The S&P 500 (SPY) (VOO) weight to energy is 6%. I believe 12-24% in portfolios makes more sense depending on your risk tolerance and goals. Here are some charts to help visualize the oil market vs the S&P 500. As you can see, from the late 1990s to 2014, energy crushed the S&P 500. Since the oil collapse, there has been a huge divergence between energy and the broader market. Think about how big of a reversion this is. And, consider that lower oil prices supported the rest of the economy and stocks. If oil rebounds as I expect, envision the divergence. We could see another period where energy crushes the broader market. 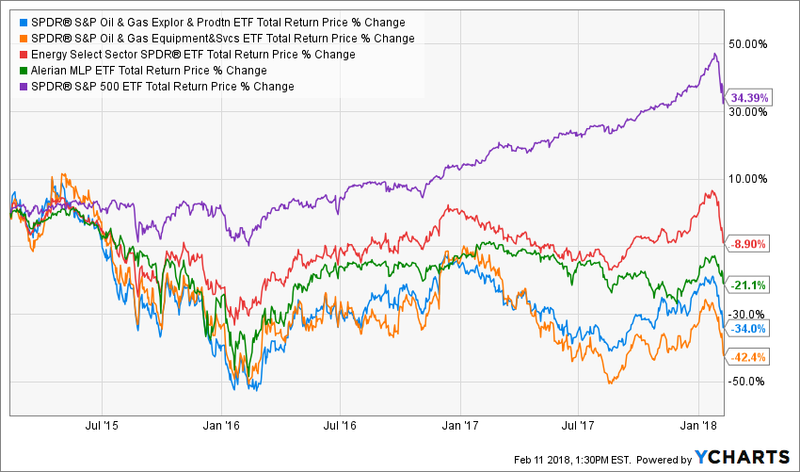 Here are four ETFs worth considering and depending on your risk tolerance and portfolio objectives worth buying during the current pullback. Alerian MLP ETF (AMLP): Master limited partnerships have taken it on the chin in the past year as political pressure and concerns over oil and gas prices manifested. EBITDA growth has been challenging although the group has not had a problem servicing its debt. Valuations have come down dramatically on the group making it more attractive, but the weighted PE ratio stands at a still high 22. 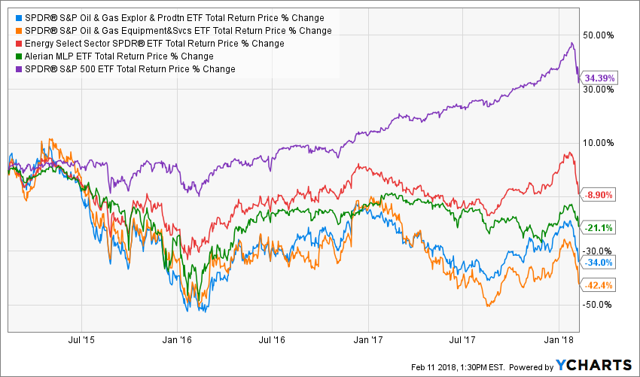 Many MLPs are making dramatic changes that could improve their position, however, as a group, this is a challenging pick with some companies still dependent on additional capital spending. 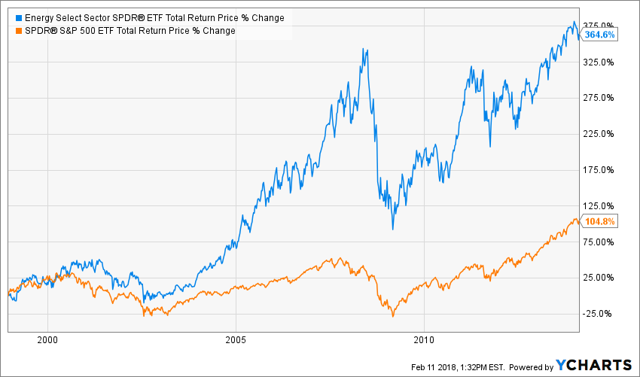 For my money, I prefer to pick out MLPs individually, however, this fund’s 5.9% dividend yield and generally solid prospects make it a buy for equity income investors. 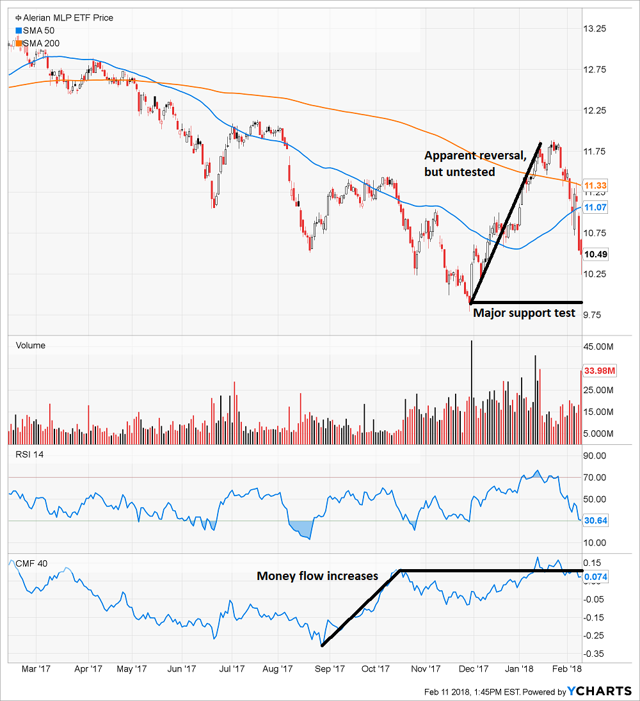 You can see from the chart below that the fund started an apparent reversal shortly after money flow improved. If it holds support this week, then I think a turnaround is imminent. 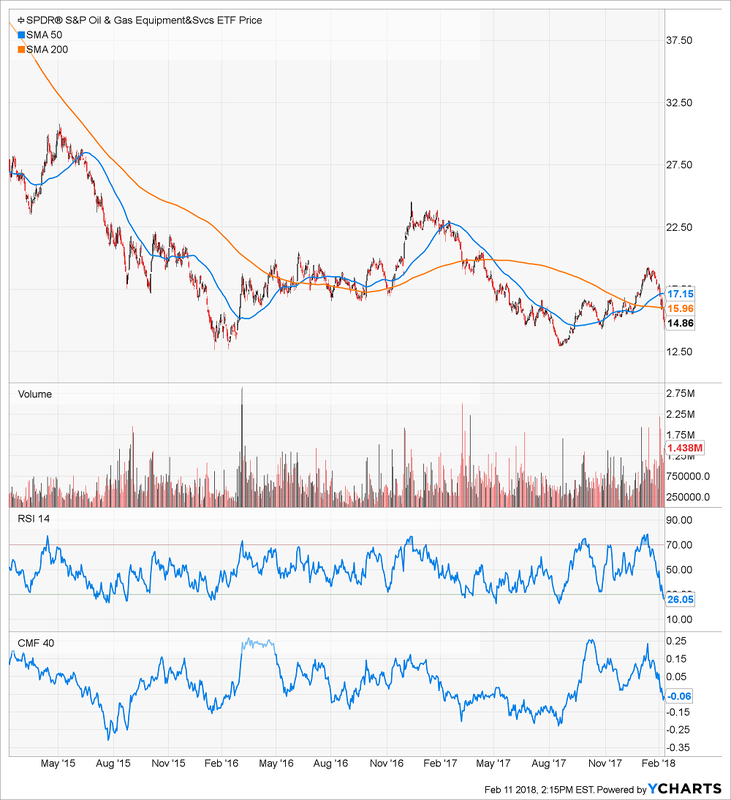 SPDR Select Energy ETF (XLE): XLE is focused on larger energy names with Exxon (XOM) representing 22.6% of the fund and Chevron (CVX) representing 16.9% of the fund. As I note below, I am not a fan of either company and believe both face legal and financial challenges in coming years. For those reasons, I do not own XLE. However, those who believe oil majors are the place to be will want to consider this fund. SPDR S&P Oil & Gas Exploration & Production ETF (XOP): This fund is equal weighted which greatly reduces exposure to the majors. Large independents and midsize companies lead the way here, which is what I am looking for in order to find some growth. The fund is approaching a strong support level, however, money flow has not turned around yet. There are a lot of doubters out there on oil and gas stocks. 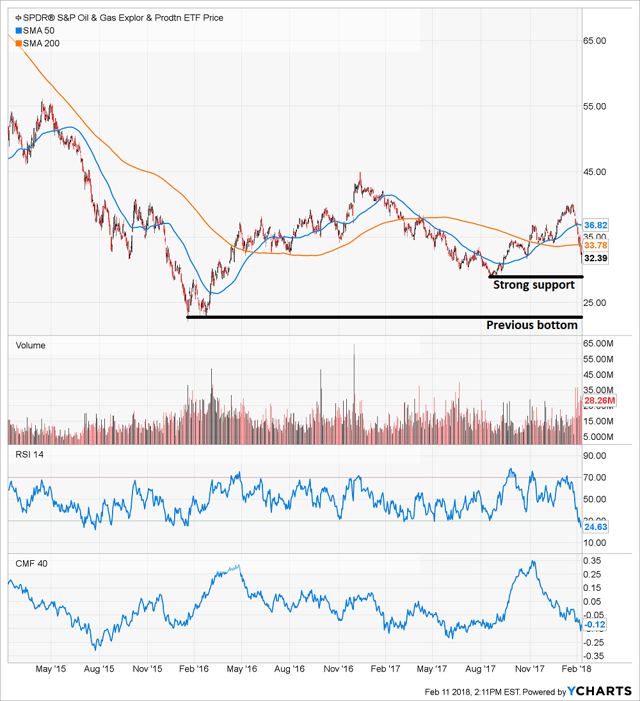 If I am right and oil heads to $80 per barrel, then there could be a violent upward move in this fund. 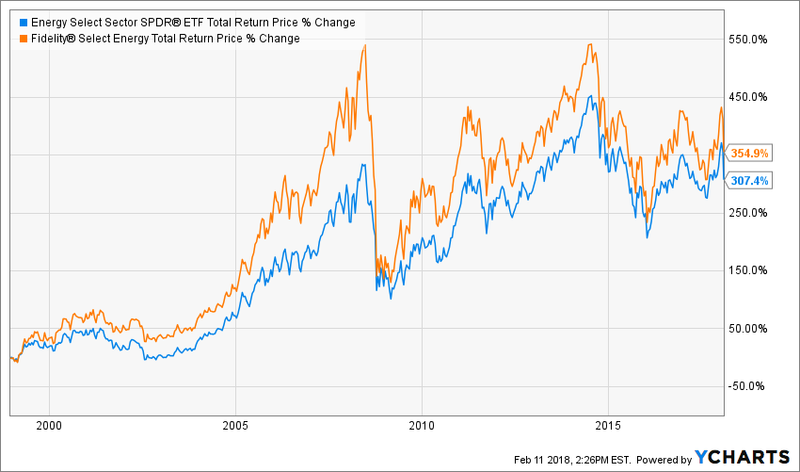 I wrote a fairly expansive analysis of XLE and XOP several months ago that compares the funds: XLE And XOP: Comparing 2 Popular SPDR Oil Stock ETFs. 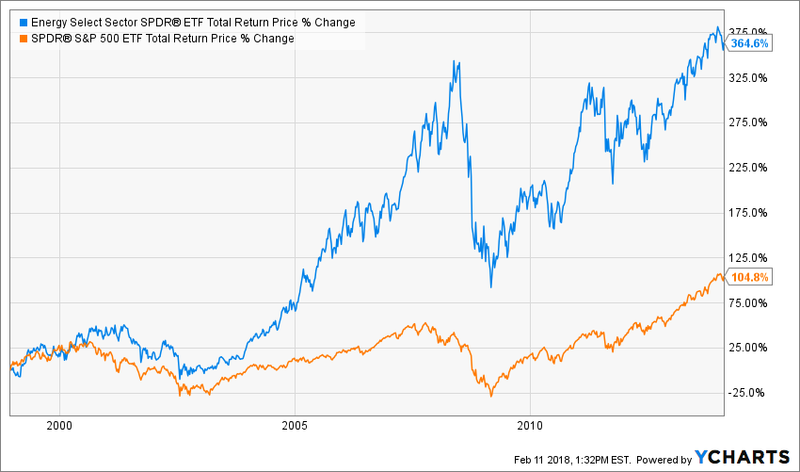 This article is now pay-walled and available to my service Margin of Safety Investing or Seeking Alpha Pro subscribers. 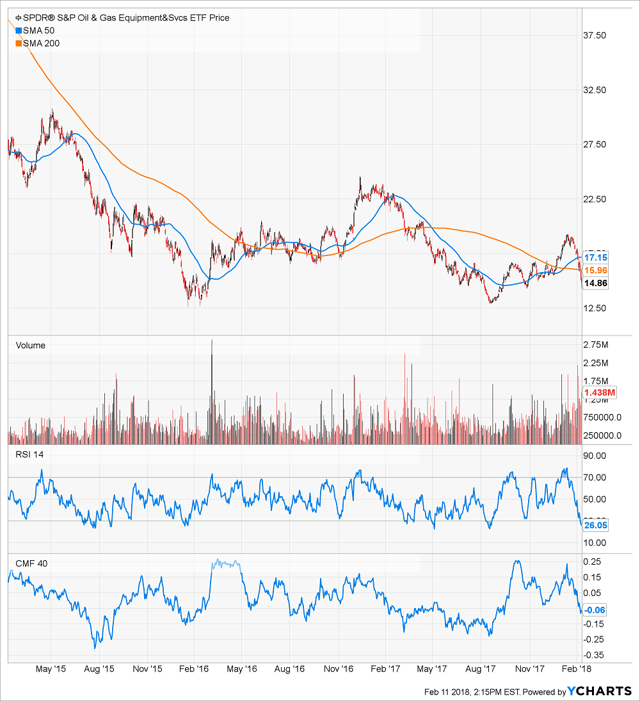 Like XOP, it is not gaining much investor support just yet and is about to test all-time lows. It could be spring loaded if there is a supply disruption. 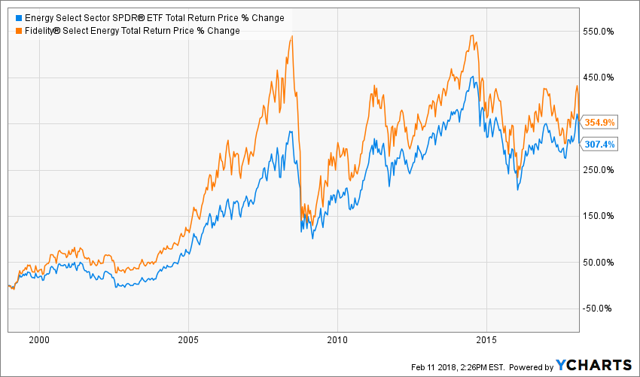 Fidelity Select Energy (FSENX): If you have a self-directed 401k plan or a retirement plan with Fidelity, their Fidelity Select Energy fund is very good. This fund is rated 4-stars and is somewhat heavier on the bigger companies than I like, but not as much as the SPDR Select Energy ETF. It is a viable alternative if you are seeking extra energy exposure in what might be your biggest account.